Share link: 2004details. See also: Basic 2004 GMM city list, 2004 GMM map, and 2004 GMM graphics. 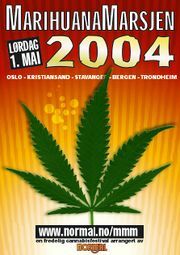 2004 Million Marijuana March posters, flyers, and banners. The links in the detailed city list below may no longer work, or may no longer lead to 2004 MMM info. Ann Arbor: Rich Birkett rbirkett"at"freedomactivist.org http://www.freedomactivist.net/hashbash.html http://www.hashbash.com Ann Arbor's Hash Bash initiates the Spring Offensive on the first Saturday of every April! Auckland: Albert Park. ph 09 302 52555 auckland"at"norml.org.nz http://www.norml.org.nz Chris Fowlie, NORML New Zealand, PO Box 3307, Shortland Street, Auckland, NZ May Day march Join NORML in the traditional May Day march, leaving QEII square (bottom of Queen St) at 2pm, arriving at Albert Park around 3pm. Bring a banner, and wear your favourite marijuana T shirt. Make some noise in support of cannabis law reform. A 4:20 dakmob location will be revealed on the day! Austin: Sarah 512-481-9123 austinnorml"at"cannabis.net http://www.austinnorml.org or Tracy Hayes 512.693.2356, 900 Bouldin, Austin TX, 78704 Sunday, May 2, the Austin chapter of the National Organization for the Reform of Marijuana Laws will host the 2004 Medical Marijuana Potluck Picnic 2-6pm at Beverly S. Sheffield Northwest District Park (7000 Ardath). Boone: Joshua Nathan Simmons krzyn8"at"yahoo.com 268-1595 http://www.hempclub.org There is going to be a THC march at the Jones House (King st. beside Mast General) May 1st "at" 1pm. There will be bands, drum circles, informative speakers and then a political march down King street. Burlington: Hardy Macia hardy"at"vtnorml.org 802-372-9512 or Denny Lane dennylane"at"gmavt.net (802)496-2387 POB 537, Waitesfield, Vt 05673 Burlington City Hall Park Noon - 5pm. Music, speakers and info tables. Chico: Dinah Coffman 530-345-1997 chicodank"at"hotmail.com or http://www.pot-party.com 1381 Fairway Alley, Chico, CA 95926 Approx. 420 participants in '02. Cincinnati: the Happy Hemptress hemptress"at"hemprock.com 513-684-HEMP. Hemprock Productions, P.O. Box 18253, Erlanger, KY 41018. http://www.hemprock.com Ours is a Rally on Cincy's Downtown Fountain Square, Sunday, May 2nd, from 2-6pm. w. Gatewood Galbraith, police officers for drug law reform, women's organization for national prohibition reform, Ohio cannabis Society, the Hemp Museum, Ohio Patient Network, NORML; Music by 8 hour blink & the righteous spirits of the universe drummers, guest MC's Doc Diablo and Senor Bull. Colorado Springs: Dr. Robert Melamede rmelamed"at"uccs.edu 719 641-1188 (Cell) Chairman, Biology Department, University of Colorado, 1420 Austin Bluffs Parkway, Colorado Springs, CO 80918 http://www.uccs.edu/~rmelamed May 2 from 12-5 at Acacia Park, Live music, talks, education etc. Columbus: Arlette Roeper ohiostate_ssdp"at"yahoo.com http://www.ohiohempfest.com March on May 1st meeting at 15th and High st at 4:20pm - march to Goodale Park. Speakers from NORML and Students for Sensible Drug Policy will be on hand. Darmstadt: (49) 160-447 12 68 sokratis"at"hanf-initiative.de Sokratis Zacharopoulos, Offenbacherstr. 42, 63165 Mühlheim, http://www.hanf-initiative.de ICQ# 175055178 March May 1. Darwin: mick lambe pariahnt"at"yahoo.com or http://napnt.org napp biggpond napnt"at"bigpond.net.au We are continually harassed by Police -- I'll forward this on to NAP as PARIAH are concentrating on other issues right now. Dover: Richard J. Schimelfenig. Delaware Cannabis Society, 63 Lawson Ave. Claymont, DE 19703 (302) 793-0716. Nathan Coffield nathacof"at"dekster.com 18 Kent Circle, Dover, DE 19904. 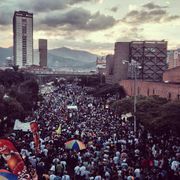 299 demonstrators, 8,000 spectators, cops watched and did nothing in '02. Dublin: "Butler, Philip" phillty2"at"yahoo.com +353 1 4163707 or jday"at"iamwasted.com http://www.cannabisireland.com/ , http://groups.yahoo.com/group/ie-cannabis/ 1,000 people in "02. Dunedin: dunedin"at"norml.org.nz http://www.norml.org.nz The Octagon High Noon to 4:20. Frankfurt: (49) 160-447 12 68 sokratis"at"hanf-initiative.de Sokratis Zacharopoulos, Offenbacherstr. 42, 63165 Mühlheim, http://www.hanf-initiative.de ICQ# 175055178 MMM in Frankfurt on the 8th of May, with warmup May 7, including films, lectures and a big GOA party. Gunnison: George 816-786-3202, prefer email at mcampbell10"at"comcast.net Meeting up at City Hall building. Helsinki : Finnish Cannabis Association http://www.sky.org sky"at"sky.org Finnish Cannabis Association, Sorvaajankatu 9 A, 00810 Helsinki, Finland 600 - 1000 people in '03, at least in the park. In the evening happening there were lots of bands but only some 300 people because of another happening for younger audience w. similar themes. Because there were demonstrations in 4 cities (Helsinki, Tampere, Turku, Oulu) in Finland, news coverage was good. TV 1 showed Helsinki demonstration in the main news cast 8.30 PM. Hilo: Roger Christie pakaloha"at"gte.net (808) 961-0488 http://www.thc-ministry.org 200 in '02. Houston: Dean Farrell http://houstonnorml.org or info"at"houstonnorml.org (281)752-9198. http://www.cultural-baggage.com c/o Dean Becker, 11215 Oak Spring, Houston, TX 77043 Total attendance was about 5 hundred in '02. Narc infiltrators mar event. Hull: Carl Wagner phone: +44 01482494789 5 Victoria Square, Ella Street, Hull HU5 3AL, U.K. A poor march in Hull, UK this year, but we had 1500 smokeybears in the park. Kansas City: mohemp"at"hotmail.com http://www.mohemp.org David 816-678-7447, 'its a beautiful day' 3918 Broadway, Kansas City MO. 64111... 816 931 6169. Elyse Max, 816-305-4564. MOHEMP, PO BOX 413681, Kansas City, MO 64141. May 8th to commence at high noon at JC Nichols fountain, Emmanuel Cleaver the II between Broadway and Main. Kingston: Paul Chang paul_chang"at"cwjamaica.com (876) 972-0817 Coalition for Ganja Law Reform, POBox 24, Laughlands, St Ann, Jamaica http://www.homeplanetearth.com March Rally Concert 10:00am Emancipation Park. London: Festival: The 6th Annual march and festival to re-legalise cannabis has been postponed to Saturday 5th June 2004. Assemble Kennington Park 12 noon. http://www.thecannabisfestival.co.uk email: info"at"cannabisfestival.co.uk Shane 020 8671 5936. ~ 15,000 people in '03..
Missoula: John Masterson, Montana NORML 406 542-8696. March starts at noon at Jacob's Island. ALong Clark Fork River, across Higgins Street Bridge and to the Court House. Gathering with drummers, fire dancers, music, free hemp treats, and bartering until 4:19- Spirited speakers and a moment of silence for those who are victims of the drug war. Montpelier: Rama Schneider vtmmm"at"ramabahama.net (802) 433-5441 address: 1614 Gilbert Road, Williamstown, VT 05679 http://www.ramabahama.net Several people handed out literature in '02. Nashville: "Howie & Marivuana Leinoff" marivuana"at"hotmail.com leinoff"at"weedmail.com (615)ACT-HIGH. 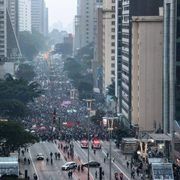 http://www.marivuana.com http://www.punkenstein.com 150 marchers, no arrests; first tv coverage in '02. New York City: Dana 212-677-7180 dana"at"cures-not-wars.org cnw"at"cures-not-wars.org http://www.cures-not-wars.org ~ May 1st, 2004 Mass March & Parade with Trance in the Park. Houston & Broadway 1pm. to Parade down to Battery Park 2-6pm. Arrest down to just 9 last year. Nicosia: Petros Evdokas petros"at"cyprus-org.net Cyprus IndyMedia and Oikologia magazine. Semi- underground gatherings will note the day. Orlando: Orange-can-owner"at"yahoogroups.com ~ 321-253-3673 is our state office number for Florida Cannabis Action Network. Oslo: Mariann: mariann"at"normal.no mmm"at"normal.no ~ Postal: NORMAL, Hjelmsgt 3, N0-0158 Oslo, Norway. ~ http://www.normal.no/mmm ~ MMM Forum: http://swecan.usmjparty.com/norcan/viewforum.php?f=39 ~ 3000+ participants. No arrests. Paris: FARId GHEHIOUECHE farid"at"no-log.org 00 33 (0)6 148 156 79 ; http://www.encod.org CAM-RD 9, passage Dagorno 75020 PARIS. The French GMfCL will be on May 8th, as ENCOD (European NGO council on Drugs policy) is calling for action from may 1st until may 8th Everyone and every groups are welcome to organize their local events in order to increase the pressure for cannabis liberation around the world. Philadelphia: Emily Petry Phillymmm"at"yahoo.com 215 238 8949 or "chuck palmer" chuckp"at"CritPath.Org Meeting at 10th and South at 4pm and taking off at 4:20 for a march down South~~all participants are encouraged to wear costumes and colorful clothing and to make signs and puppets expressing their love for marijuana, hemp and all its possibilities!! Pilsen: http://www.exist.cz "pavla kozakova" exist"at"post.cz 200 people and one sound system in central park in '02. No arrests. Potsdam: chillout"at"potsdam.de, Tel. 0331-7405540, http://www.chillout-pdm.de/ All-day hemp event. Rapid City: Bob Newland newland"at"rapidcity.com 605-255-4032 website: http://www.sodaknorml.org/ 300 marchers in '02. 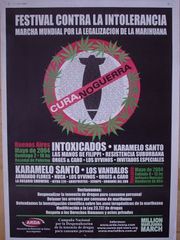 Rosario, Argentina: Saturday, May 8. 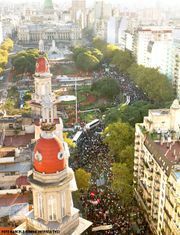 Argentina Harm Reduction Association. http://www.infoarda.org.ar ~ http://www.arda.iwarp.com ~ Asociacion de Reduccion de Danos de la Argentina (ARDA), arda"at"fibertel.com.ar ~ Presidente: Dra. Silvia Inchaurraga sinchaur"at"agatha.unr.edu.ar (54-341) 420-1291. ~ Secretario General: Lic. Gustavo Hurtado ghurtado"at"fibertel.com.ar (54-11)15-5389-0266. 4000 to 6000 people! One of largest MMM 2004 events worldwide! http://www.vienna2004.org/mmm Photos. Sacramento: May 22 (cancelled due to new prohibitive state-imposed insurance fees). 12:00PM to 6:00PM. South Steps of State Capital. Kevin Burger or Jolie Perea at 1 (877) 806-7058 or by email kevin"at"camedpot.com or jolie"at"camedpot.com ~ Mark C. Alire mediacoordinater"at"camedpot.com ~ Brian brian"at"camedpot.com 877 806-7058. 3337 Feltham Way, Sacramento, CA. 95827. http://www.camedpot.com http://www.californiacannabiscooperative.org We welcome all patients, sponsors, advocates, the general public, owners/operators/staff of: cooperatives, care givers, and dispensaries to join us. Volunteers needed. San Diego: Donna Lee (619) 223-1050 cannabiswoman2002"at"yahoo.com http://www.cannabisfreedom.org Approximately 50-75 attendees. NO POLICE! NO PROBLEMS! Santiago: Colectivo Zona de Sintesis qnodecaiga2003"at"yahoo.es http://www.zs.cl We support the anti-prohibitionism proposal and the legalization of every drug, starting with marijuana. Savannah: Kellie Gasink metrogpcc"at"lycos.com 912-341-0307. 3 pm, Grayson Stadium in conjunction with Mayday rally. Springfield: Joe Setzer (417) 877-6832 theosopher420"at"yahoo.com 137 Hackberry Lane, Seymour, MO 65746 The march will begin on the Springfield Square at 4:20 sharp, and will take approximately 1 hour (allowing time for dawdling). St. Louis: 314-567-8522 or St. Louis Area NORML , PO Box 220243, St. Louis, MO 63122. http://www.gstlnorml.org 600 marched to the Arch for cannabis reform. Tel Aviv: Boaz Wachtel -- wachtel"at"shani.net Tel:972-54-573679 http://www.ale-yarok.org.il PO Box 2983, Even Yehuda, 40500 Israel -- 4,000 participants in '02. Tokyo: Takao Bakuya (Cannabist) info"at"cannabist.org +81-3-3706-6885 http://www.cannabist.org 1,200 participants in '03. Traverse City: Melody Karr fiddlefoot420"at"hotmail.com (231)885-2993 PO Box 524 Mesick, MI 49668. or 10954 Birch Road Mesick MI 49668. http://www.geocities.com/legalizemichigan/traversecity.htm Saturday May 1, 2004 Gather at 2 p.m in front of the Chamber of Commerce 202 East Grand View Parkway Traverse City, MI March at 2:30PM, Rally at Shimmers 3:30 to 7:30. Tupelo: Anita T. Mayfield. 662-963-0775. nita420"at"bellsouth.net ~ May 1st at the Lee County Courthouse square between 2-6 pm with a march at 4:20 pm. Bring signs. Will have refreshments, varied guest speakers, merchandise and musicians. No illegal substances allowed. Turku: Vihreet Pantterit http://www.vihreetpantterit.org info"at"vihreetpantterit.org Will be doing their event May 8th. "Stop the cannabis arrests! Stop the lies! Free the medicine! Legalize homegrowing!". Upper Lake, Ca. : Linda & Eddy Lepp"linda senti" lisenti"at"home.com 707-275-8879. Several hundred showed up, 140 new patients signed up. in "03. Visalia: Jeff Nunez njeffsun"at"sbcglobal.net or DC 209-357-2154 http://www.budlife420.com Event is May 2. Washington, D.C.: Toni Keane MMM_DCA"at"hotmail.com http://violate_wave.tripod.com/MMM.html or John Pylka fjhc"at"hotmail.com This year's event will be on Saturday May 1st. 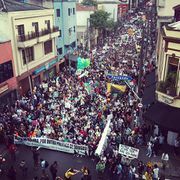 We are starting planning now so if you want to help organize for the 2004 march, contribute items or funds, help with publicity or even just help with permits and location, e-mail me. Wichita: Debby Moore, CEOHemp Industries of Kansas 2742 E. 2nd Wichita, Kansas, 67214 (316) 681 1743 debby"at"hempforus.com; or c.a. riley, Kansas NORML 316.685.7869 ksnorml"at"ksnorml.org http://www.ksnorml.org Last year about thirty people met and marched through downtown Wichita. I will plan a cookout with speakers, but will certainly discourage any smoking of the herb cannabis. Yuba City: Darren Courtney yuba_sutter_mmm"at"yahoo.co 530-864-2964 The march will start at Noon, in Marysville (Yuba County side) at the Vietnam Vets Memorial, which will move across the Feather River on the ped walk way, which passes by the Sutter Co. Courthouse. The march will continue down B Street to the Fountain at the Yuba City Town Center (Sutter County side). At the fountain, we will wrap up with testimonies, music (pending: contacting city on this), networking, sharing and caring. This page was last edited on 10 January 2019, at 20:06.